A couple weeks ago I got a call to assist with an Apple iMac desktop that failed to boot into Mac OS X. A quick assessment over the phone gave me enough information to know it’s likely a dead hard drive issue which prevents the iMac from booting and stuck at the flashing question mark folder screen. I took the iMac home attempting to retrieve the data on it and to replace the dead hard drive with a new one. It’s worth mentioning this iMac was not even two years old – it is very unusual for a hard drive to die in such short period of use. The typical life span for hard drive is 3 to 5 years on these iMacs. The moment I had the iMac opened, I knew exactly why the hard drive had such short life. There was dust pilling up every where inside the computer. 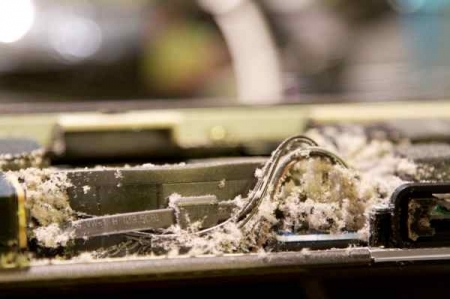 Essentially the dust blocked the air flow and kept all the heat trapped inside the computer. The hard drive on these Aluminum iMac is placed right in the middle of the chassis and arguably takes the most punishment from heat build-up. Luckily though, the hard drive was the only component that failed and not the other crucial parts (which are much more expensive to replace). So if you have an aluminum iMac at home and in a room without good ventilation, check the bottom vents often to make sure there’s no blockage of air flow. A quick way to do so is to tap either the bottom right or left of the iMac and watch to see if there’s dust particles falling out. Seeing a chunk of dust drops out of the vents is a sure sign you should call The IT Sage for advice.